Identifying 1st Edition Beginner Books – Part 3 Newbery, Caldecott Awards Announced Today! Similar to a couple of years ago, we recently performed an internet search for the first editions of the first twenty Caldecott Medal books, wondering how many are currently being offered for sale. The searches were performed across multiple book sites, ABE, ABAA, and Bookfinder, and were filtered for first edition books with dust jackets. Across the twenty Medal winning books, there are thirty-five first edition books currently for sale, with an average asking price of $822. In our survey we did not adjust the asking price to the condition of the book being offered, so the average price should be used judiciously. 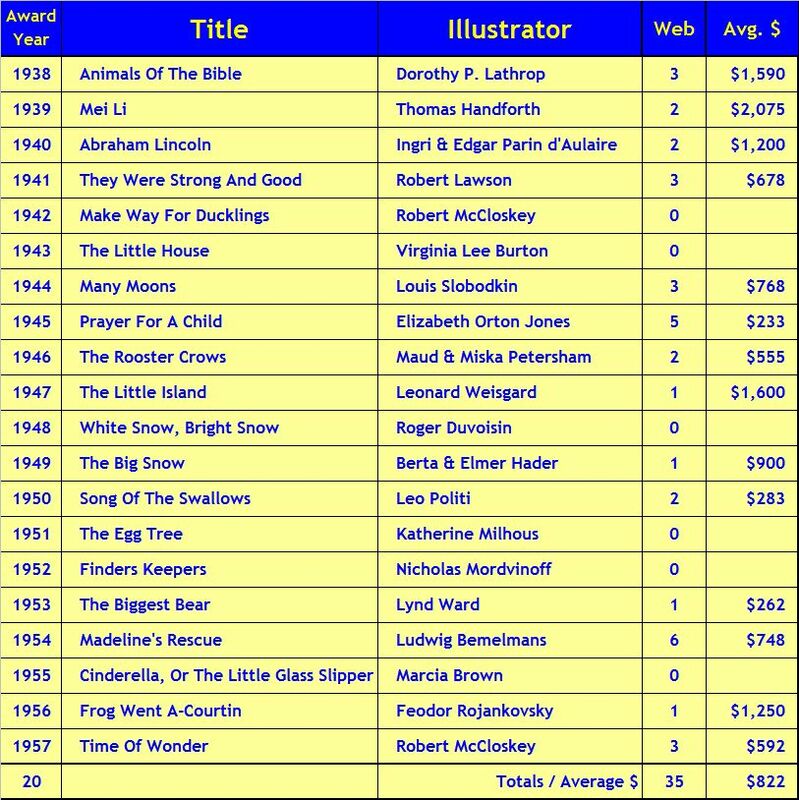 There were six copies of the 1954 Caldecott Medal winner Madeline’s Rescue on the market, the highest quantity for sale across the respective sample set. The average asking price is a healthy $748, indicative of the high desirability of this second book in the iconic Ludwig Bemelmans’ series. Madeline the first book in the series, was published in 1939 and earned a Caldecott Honor award (there is only one first edition copy currently on the market, offered for $4000). Madeline is a ‘tough get’ in first edition with dust jacket. The Little Island, illustrated by Leonard Weisgard, is another tough find, in part due to authorship by Margaret Wise Brown, under the pseudonym ‘Golden Macdonald’. Books authored by Brown have an avid collectible following, with The Little Island being the eighth book she wrote under the Macdonald pseudonym. Brown wrote her ninth, and last book as ‘Golden Macdonald’ some ten years later, in 1956, Whistle For The Train. While Weisgard illustrated hundreds of children’s books, his work in The Little Island earned his only Caldecott Medal. There was one copy of Frog Went A-Courtin, on the market offered for $1250. Illustrated by Feodar Rojankovsky and written by John Langstaff, Frog Went A-Courtin is the first of two books by the pair, who colloborated on Over In The Meadow in 1957. Six of the twenty books are not currently being offered for sale on the internet. Understandably it would be a seller’s market for any of these books in first edition format with dust jacket. As was expected, Virginia Lee Burton’s The Little House and Robert McCloskey’s Make Way For Ducklings are not currently available. First editions in dust jacket for either book do not surface for sale very often. 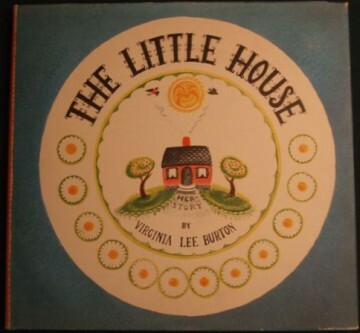 Since 2000, we have seen only one first edition copy of The Little House for sale (Sigh…regrets abound), and one copy of Make Way For Ducklings for sale. Similar to when we performed this survey two years ago, there are no first edition copies of White Snow, Bright Snow, Cinderella, and Finders Keepers, currently for sale in the market. These three books are not as scarce as The Little House or Make Way For Ducklings so one would think the demand would eventually cause first edition copies to surface. It is somewhat surprising to see no first edition copies of The Egg Tree on the market. Katherine Milhous’ Easter homage to her Pennsylvania Quaker heritage is not too scarce.